PRODUCT: U.SEAL (U-Seal) EMBOSSED ALUMINUM FACED, PEEL/STICK ROOF TAPE, 2" WIDE x 33' LONG x 60 MIL THICK. 6 ROLLS/CASE. PRICE/CASE. LIMITATIONS: Not recommended for use with PVC or EPDM roofing, or sealants containing polysulfides. 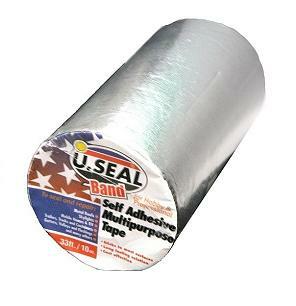 FEATURES: U.Seal roof flashing / waterproofing tape has a heavy aluminum facing (requires no UV protection) together with an extra thick rubberized asphalt based adhesive system. The aluminum facing is embossed to provide flexibilty for wrapping irregular shapes and surfaces. Overall the tape is 60 mils thick -- more than double that of most others. Product Data Sheet Total Thickness: 60 mils. APPLICATION: The surfaces to be sealed must be clean, dry and free of loose rust, scale, dust, talc and dirt. All oil, grease, silicone or other contaminates should be first removed with a suitable solvent/cleaner. For older roofs use a stiff brush to remove all loose granules and surface elements. Porous surfaces should be primed with a common asphalt based primer and allowed to dry before U.Seal is applied. Install U-Seal by gradually peeling away the plastic release liner while rubbing the U-Seal to the surface. Hint: prevent bubbles under the product by using your hand to squeegee out air by wiping your hand towards the roll as you set the tape to the surface. Overlap seams or sealing are of application by 3 inches. OPTIONS: Available in sizes 4, 6,and 39 inches wide, and in faces of white aluminum, terra cotta aluminum, and embossed aluminum. EternaBond AlumiBond AS-2-50, 2 inch wide x 50 foot roll. Heavy aluminum faced peel/stick flashing, roof repair and waterproofing tape. 15 year Eternabond Warranty. Made in USA. Price/Roll.